Research shows that investing in parenting is the most important way to help a child to succeed in school and later in life. Strengthening parenting has multiple positive outcomes for children, including higher school achievement and fewer mental health issues. In 2016, PEP piloted its new Partnership Program to provide low-income families with free parenting education to help at-risk children. Our inaugural partner is the Linkages to Learning program in Montgomery County Public Schools. Together, we provide low-income, Latino parents with parenting classes and support in Spanish. We hope to work with additional partners and audiences as the program grows. In the 2017-18 school year, the PEP Partnership Program, partnering with the Montgomery County Linkages to Learning Program, expanded to bring parenting education programs to low-income and under-served populations in five participating public elementary schools: Rolling Terrace, JoAnn Leleck, Washington Grove, Kemp Mill, and Georgian Forest. At each school, PEP-trained class leaders presented a series of five to six weekly, two-hour workshops in Spanish, followed by an additional class meeting during which participants were given certificates of completion and gift cards to area grocery stores. Through the Partnership Program last year, PEP served 90 low-income Latino families. Want to get involved or learn more? Contact PEP’s Program Director Trish Pannuto at Trish.Pannuto@PEPparent.org. 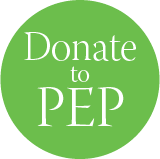 Support this program and help PEP make a difference in the lives of at-risk children. I used to speak in commands to my son, like, “Pay attention in school!” Now…I look at my son with a different face, when I talk with him. Before, when I yelled, he would look down and mumble “okay.” Now, he looks at my face when he talks. I can see the difference, in the way he looks at me. He feels good because he knows he can make a decision. I liked the way the class leader followed up with me. I really appreciated it. I always thought that after a class ends, it’s over. But the class leader took time in between classes…to help me. PEP has helped me communicate so much better with my kids – not only by approaching them in different ways, but also to know to listen to them and make them feel that I care about their opinion.